We marked Armed Forces Day at the Vicarage with a trip to our local where we celebrated with a tipple and a good old sing song of all our favourite songs of the 40s before making our way back to the Vicarage for our pre organized ‘street party’ in the conservatory. 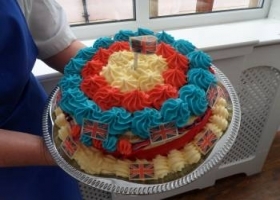 We enjoyed a beautiful buffet prepared by Helen and her team in the kitchen before singing ‘ God save the Queen’ as our Celebratory Cake was bought in. We had moment of reflection to thank our brave ladies and gentlemen of our Armed Forces who have given so much over the years… for which we are truly grateful.